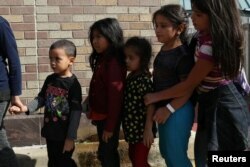 Children form a line as undocumented immigrant families are released from detention at a bus depot in McAllen, Texas, June 22, 2018. Honduran brother and sister wait on the Mexican side of the Brownsville & Matamoros International Bridge after their asylum seeking family was denied entry by U.S. Customs and Border Protection officers near Brownsville, Texas, June 26, 2018. Syracuse University's Transactional Records Access Clearinghouse (TRAC) used case-by-case Freedom of Information Act requests to find out just what was going on at the border between October 2014 and April 2018, when the Trump administration's "zero-tolerance" policy was announced. In spite of it, the numbers show arrests are down. But deportations are happening sooner. 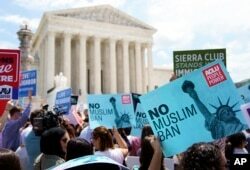 Protesters hold up signs and call out against the Supreme Court ruling upholding President Donald Trump's travel ban outside the the Supreme Court in Washington, June 26, 2018. "I feel like a second-class citizen," a Syrian refugee told reporters after the Supreme Court upheld President Donald Trump's travel ban. The court's action changes nothing in terms of the policy, which has been in effect since last year, but it does close the door on those who had hoped it might be changed. The libertarian CATO Institute reports that travel from the ban's seven targeted countries is down 86 percent and immigration is off by 93 percent in the first five months of 2018. How many times have both Trump and immigration advocates called on Congress to do something about immigration? It still hasn't. In fact, after failing to pass a "compromise" bill this week, lawmakers are off for a long holiday. 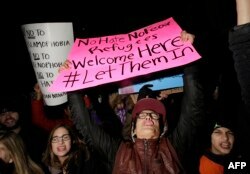 Demonstrators protest President Donald Trump's executive immigration ban at O'Hare International Airport in Chicago on Jan. 29, 2017. Christian refugees are making up a greater percentage of those accepted by the U.S. for resettlement than they have in 16 years. They primarily come from Africa and, notably, not the Middle East. The proportion of Christians may be higher, but nobody's cheering. 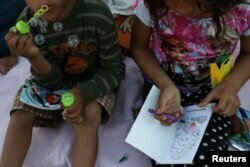 The U.S. is on track to accept fewer than 22,500 refugees this fiscal year, a historic low.